GSAT-14, actually the 13th GSAT spacecraft to fly, is a Communications Satellite developed and built by the Indian Space Research Organization. The satellite is based on the I-2K satellite bus that has been used for a number of ISRO satellites of the 2,000-Kilogram weight-class. 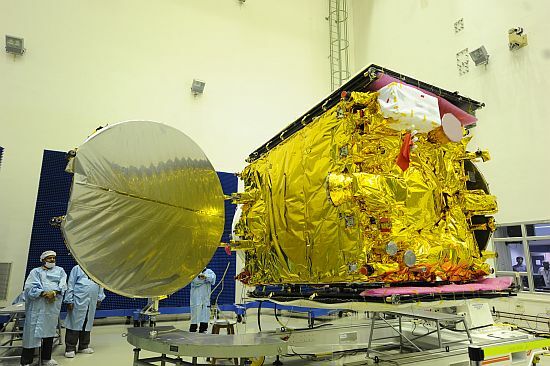 GSAT-14 weighs 2,050kg at liftoff featuring the conventional I-2K bus section with two deployable solar arrays and batteries along with avionics and data handling equipment as well as a propulsion unit and navigation equipment. GSAT-14 is 2 by 2 by 3.6 meters in size featuring a 2-meter and a 2.2-meter shell shaped reflector antennas. The satellite is equipped with a Liquid Apogee Motor. It provides a thrust of 440 Newtons and uses Mixed Oxides of Nitrogen as fuel and Unsymmetrical Dimethylhydrazine as oxidizer. The engine operates and an mixture ratio (O/F) of 1.65 and has a nozzle ratio of 160. The engine’s injector is a co-axial swirl element made of titanium while the thrust chamber is constructed of Columbium alloy that is radiatively cooled. The engine is certified for long firings of up to 3,000 seconds. 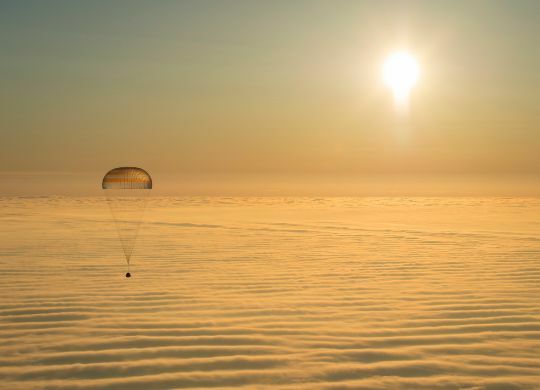 The Propellants are stored in spherical tanks that are pressurized with Helium. The satellite payload consists of six Ku-Band and six C-Band transponders that will provide coverage across India. Also, a Ka-Band payload is installed on the vehicle which will transmit signals at 20 and 30 GHz to study the use of Ka-Band for satellite communications with focus on cloud and rain effects on signals. 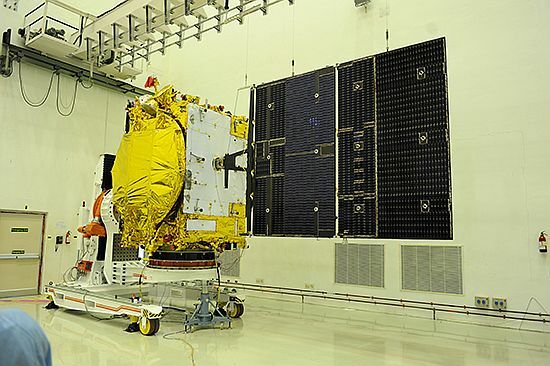 In addition, the GSAT-14 satellite is outfitted with a number of technological experiments for evaluation including fiber optic gyros, an active pixel sun-sensor, round-type bolometers and field programmable gate array based earth sensors. New thermal control materials are used on the satellite for evaluation. GSAT-14 will be stationed at 75 degrees East in Geostationary Orbit with a life expectancy of 11 years.